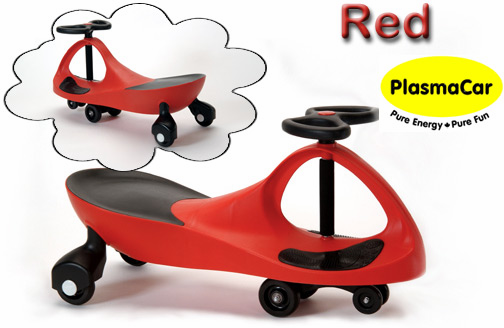 The PlasmaCar is an innovative toy that is fun to ride. No batteries or power source is required. Kids provide all the energy necessary to propel this toy vehicle forward. Very few toys have as many merits as those of the PlasmaCar. This award-winning toy vehicle provides fun and gives children a chance to exercise at the same time. The technology behind the design is very sophisticated, yet children easy and quickly learn the operation. There are no pedals, nor any external power source or batteries necessary to use this toy vehicle. It moves forward when the child sits on it and turns the handlebars from right to left in a vigorous manner. The construction of the vehicle is durable plastic for long-lasting use. It arrives fully assembled. The PlasmaCar works best on a flat, smooth surface. It is not recommended for use on laminate wood floors or hardwood floors because the way the children to move the vehicle forward, may damage or scratch the wood flooring. Extensive engineering has gone into the design of this product, with the safety of the children as the main concern. It won the gold medal in 2001 for innovation in product design at the Hong Kong International Patent Fair. In 2005, it won another award in Europe of the Gold Seal from the Oppenheim Toy Portfolio. After that, it won other awards including one in America from an independent consumer review organization for safety and fun of operation. It works from the unique combination of using the energy of centrifugal forces combined with gravity to overcome friction and inertia. On a flat, smooth surface, the carrying capacity of the PlasmaCar is 200 lbs. On a flat surface that is a bit rough, the carrying capacity is 120 lbs. It is suitable for children from the ages of three to twelve. This is one toy, which makes a delightful gift as children immediately jump on it and take it for a ride.